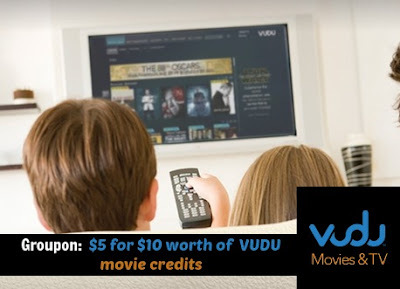 Head over to Groupon and score $10 worth of VUDU movie credits for only $5! What's better than watching a brand-new movie? Watching a brand-new movie from your own home. Thanks to VUDU, you can do just that and more. The service allows participants to rent or buy films and TV series and watch them through Internet-enabled devices, including their TVs, PlayStations or Xboxes, and Rokus. They can also download an app on their smartphones and stream new releases, cinematic classics, and bonus free episodes of television programs. VUDU is free to join and provides instant access to over 100,000 titles to rent or own in up to 1080p resolution and 7.1 digital surround sound. With VUDU, customers can rent or own without worrying about late fees, point systems, contract commitments or monthly subscriptions.